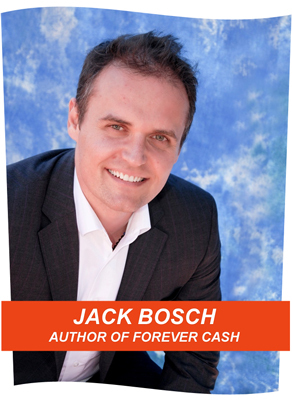 Jack Bosch became a millionaire before the age of 35 and has been training tens of thousands of entrepreneurs around the world on how they can view wealth differently and create their own model for living out their financial goals. Bosch, 43, is an entrepreneur, nationally recognized speaker, and a wealth mentor. The German immigrant earned his riches through real estate investments and online businesses. He left his job after a corporate downturn, in search for financial security and the American Dream. Within 18 months, he reached his goal by developing and implementing his “Forever Cash” financial philosophy. His new book, Forever Cash: Break the Earn-Spend Cycle, Take Charge of Your Life; Build Everlasting Wealth, spells out how one can embrace a new vision on how to achieve wealth and financial freedom. For the past decade, he has served as the president of Orbit Investments, LLC. For the last five years his investment trainings and educational seminars have informed participants on the fundamental secrets to creating and maintaining lasting wealth outside of the traditional 9 to 5 working world. His strategies for achieving life abundance are shared in workshops entitle The Land Profit Generator, The Hidden Tax Sale Cash System, and Tax Sale Guides. He earned a college degree in business at the University of Stuttgart in Germany. He also earned an MBA equivalent at Germany’s University of Mannheim. He earned a Master’s in Business Administration from Western Illinois University. He worked for five years at Siebel Systems as a CRM system implementation consultant and business analyst before leaving the corporate world in 2003. He is married and they have a daughter, 6. They live in Phoenix, Arizona.